I collect recipes. Some are typical, others are crazy, and there are some that I hold on to because they were given to me by my grandmother or mother who were so inspired by the recipe they clipped it or asked for it. 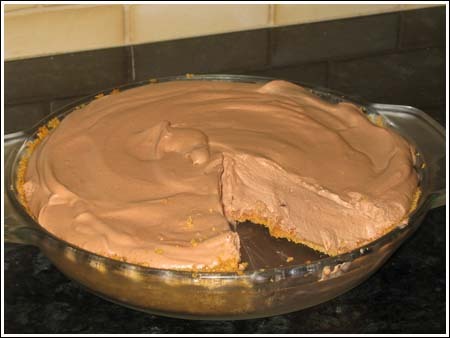 Hershey Bar Pie is one of those recipes. My mother tasted Hershey Bar Pie at a party and came home raving about it. I was a teenager at the time and going through a phase where I found this type of dessert unappealing. My mom never got around to making the pie, but she put it in her file which she eventually handed over to me. What led me to finally make the pie is that I’m on this Hershey with Almond bar kick. I still prefer to eat the chocolate straight from the wrapper, but my husband likes cream pies so this was a way to get him in on the Hershey Bar with Almond action. This is not a fancy dessert and the chocolate is milk, so you raging chocoholics may find it a bit lightweight in that department. But my mother loved it and my husband loves it and all these people loved it too. So here’s the recipe as I made it. I might try it with dark chocolate next time, but might not since others liked it so much. It was fun to make, that’s for sure. Note about photo: This was taken yesterday when the pie was only 4 hours old. Today it is firmer and more attractive. 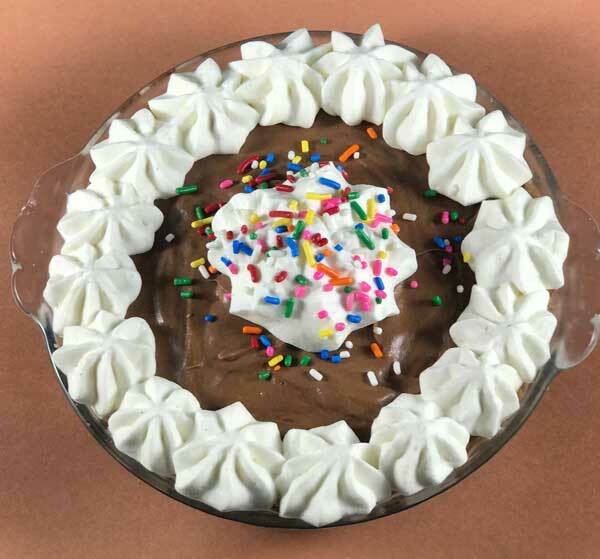 Update: This pie is also great when made with semisweet or bittersweet chocolate chips. The pie in the first photo is one of my more recent ones. I used chocolate chips instead of Hershey Bars and halved the recipe to fill a small pie dish. An easy chocolate cream pie where marshmallows stand in for gelatin. This pie can be made with the namesake Hershey Bars or any other kind of chocolate. In a bowl (preferably metal), whip the cream until fluffy. Stir in the vanilla. Fold the whipped cream into the cooled chocolate mixture, scoop it put all in the pie shell. Chill for 4 hours or even better, overnight. If you are using a smallish store-bought graham cracker crust, it may not all fit. *Homemade Graham Crust: Mix together 1 1/4 cups graham cracker crumbs, 3 tablespoons sugar, 6 tablespoons melted butter. Press into a greased 9 inch glass pie plate and bake at 350 for 8 minutes. Cool. If you'd like to add freshly sweetened whipped cream, whip 1 cup of cream until soft peaks form, then add 3 tablespoons of powdered sugar and whip just until peaks are stiff. Stir or beat in the vanilla. Pipe around edges or spread over the top. There was a recipe in a magazine I tried years ago and it had the almond crust.. The candy bar pie I’m looking for has NO cool whip. The crust was almond/graham cracker, and there was an apricot glaze. Melt large hershey bar in microwave until melted. Add 8 oz of cream cheese and beat until smooth. pour or should I say spoon into chocolate graham cracker crust and put it in the fridge for a few hours till set. I like special dark the best but regular milk chocolate bar works great too. My grandmother made this pie for years. It is always a favorite and was quickly devoured. This will become a family tradition if you are a chocolate lover. Thank you grandma for introducing it to our family. We miss you. I have a recipe that is even easier! 1. Melt a large Hershey Bar in a double boiler (or on low power in the microwave). 2. Add a defrosted container of Cool Whip. 3. Pour the mixture into a baked pie shell and refrigerate. this looks delisous, but do you have to use almonds? MMMMMMMMMMMM!! LOOKS GOOD!~!! VERY TEMPTING!! can you use cool whip or does it have to be heavy cream?? The pie looks great! But what type of heavy whip cream used in that picture? Yum. I made this for the kids this weekend and they all loved it. Interesting how it has all the ingredients for a Smore but it doesn’t taste like a smore pie at all. I didn’t use chocolate with almonds but I chopped up some almonds and added them. Very good pie! Thanks! YUM! This looks so good. And fattening. mmmmm, that looks great. I think I might have to make it with a darker chocolate though. I’m just not so fond of milk chocolate. Trader Joes has some dark chocolate with almonds, I might try that instead!